I have made 12" blocks from 2 1/2" batik fabric strips, and have decided I need sashing to set the blocks off. Will it be OK to use regular cotton quilting fabric for the sashing for do I need to stick to batik fabric. Your advice appreciated. You can definitely mix regular quilting fabric with batiks. I've been doing it for many years. Coincidentally, there was an article in a recent quilting magazine about "the new trend spotted at the October 2012 quilt shows of mixing batiks and non-batik fabrics." Here is an example of one of my recent projects. A few of the orange and purple fabrics are batiks. A few fabrics are old fashioned calicoes. 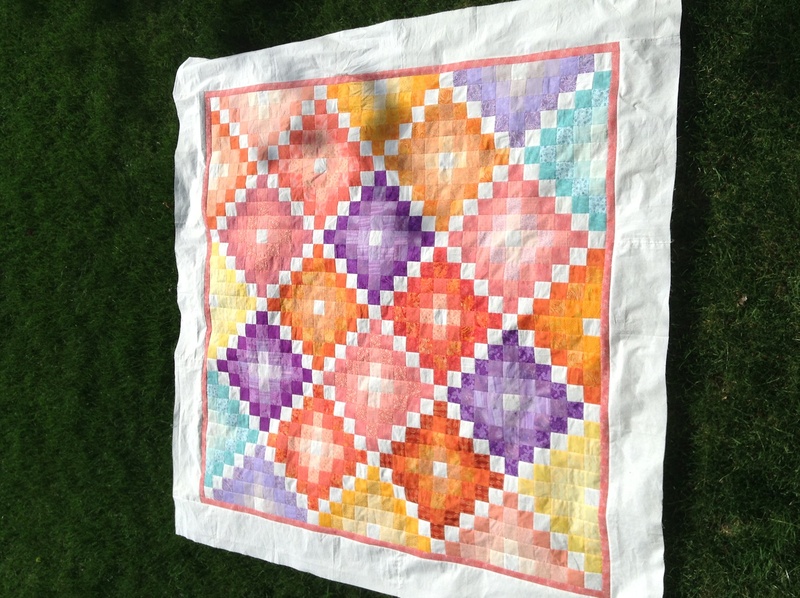 Beautiful quilt, Jenny! To answer the question, I've used quilts and "regular" cottons several times. I did make sure that everything had been prewashed because depending on the source of the batik the dye may not be colorfast. Perfectly acceptable to use both batiks and non-batiks in the same quilt. I agree with ArtsyOne on the prewashing. Then again, I'm a prewasher anyhow. I've used batiks and nons in the same quilt many times. batiks are regular cottons- the design/dyeing technique is the difference- you can mix batiks with any other cotton fabric you want...I've used flannels with batiks, regular cottons, done mixed fiber appliques on batik quilts....as long as fabrics can be cared for together they can be used together. I think the critical factor is the 'care factor' - especially if the item will be cleaned at some time. ​I have used batiks with regular cotton fabric. I personally prefer to use batiks with either more batiks or with cotton prints that are similar in character to batiks - ie. blenders, marbles, designs that complement the batiks used, like spirals or whatever. For me it is a design issue, not a type of fabric issue. It's your quilt---------do what makes you happy. Batiks and cottons work together fine. I would avoid using polyester fabric with cotton or batik fabrics. They have never worked together for me so I avoid using polyester fabrics for quilts.